“Foal, heed what is being said. Come to the Love spot in your Heart, where your Soul breathes. 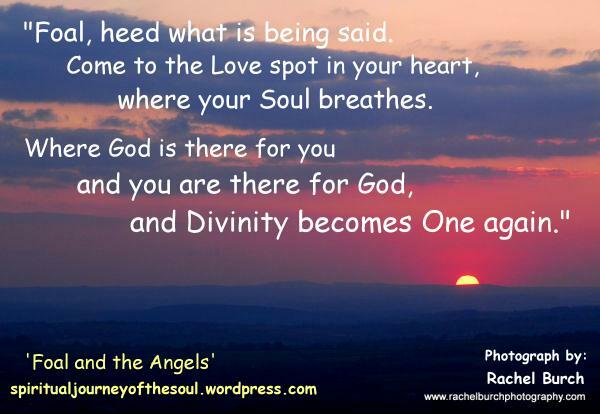 Where God is there for you and you are there for God, and Divinity becomes One again. I bring you a message of Compassion. Compassion for the family around you, for the friends around you and for those not around you, for the people who must suffer and for the people who make suffer, for the whole world. Open your Heart to needs untold. Open your Soul to demands of Love. Open your Higher Self to yourself. The Compassion you have, let it flow, and let it flow close, before it goes far. Bleeding Compassion springing forth to another Being. The Blood is the Seed. The bleeding heart sows beautiful seeds in the land. Its vibration reaches down, density lifts up. A bleeding heart is not all about suffering. A bleeding heart bears the Child of Compassion. From those blood-drops, flowers spring and quench their thirst. Do not be afraid of pain. It is only a façade. IT IS NOT PAIN. It is a facet of Love, the Love of God. A good life is not free of pain and worries. A good life is full of these and their solutions. In the finding of the solutions, you find your Evolution. Astonishing is the Power of Love and the Light it sheds on the people it touches. Cherish others for the wonderful Beings of Light they are. See them with your shining eyes for the Light they hold inside. Respect the Being of Light hidden in that clothing of flesh. So you can mirror your Light one into the other and know. Do not let yourself see yourself as you are, because you are not. You are not what you see. Human perception will see the human you. Divine perception sees the Divine you. This is how God sees you. This is how God trusts you. This is how God put Faith in you and gave you Life. Life is a deed of Trust. God trusted you with LIFE, Foal. You were born because you were trusted. Thus answer that Trust and trust the Love of God that makes you move, that makes you think and feel. And rejoice in that Trust, in that Love. Thank you, sophiebowns ! very few people take the time to stop by and leave comments. it is truly appreciated ! by the way, just browsed your Blog. NICE ! will go back to have a better look again . I think that, particularly in Western society, many people interpret “love” to imply a possessive, often sexual emotion. About the closest we can arrive at love, as you use it, is the original Greek concept of agape. Of course, this requires people to put aside their own judgemental values, and see and accept the other for what they truly are. True, Marco ! i think too there should be another term for it. Sometimes it can be misleading. This kind of Love is all-embracing and inclusive, no sense of exclusion or judgment. thank you for the reminder !